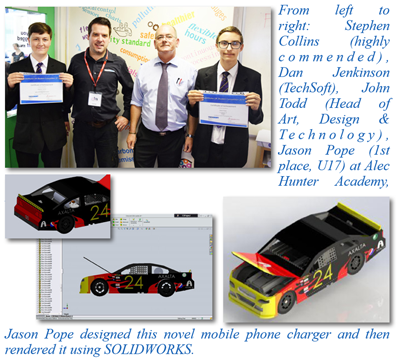 Each year TechSoft hold 2D DESIGN and SOLIDWORKS UK Schools Competitions so that deserving students can be given recognition for their CAD/CAM project work. in Cheshire, with his outstanding Arduino Robot Arm. 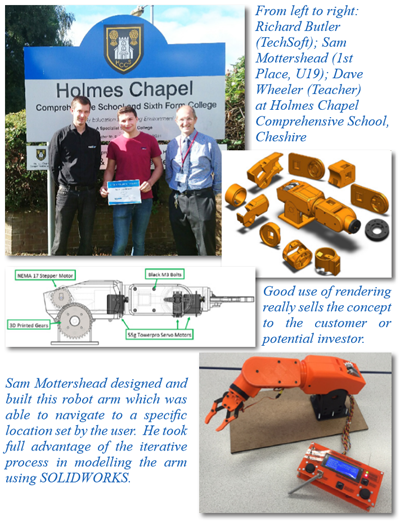 Sam showed an incredible amount of skill by designing, manufacturing and programming his working model of an industrial robot arm. He used SOLIDWORKS throughout the design process to create a complete computer model of the robot arm and the components within it, and then by exporting stl files, printed out the different parts in PLA. He then pieced the 3D parts together, creating a 3-axis system controlled by an Arduino chip encased in a control panel (designed in 2D DESIGN and then laser-cut in acrylic). The result was a high quality model, designed to be easily replicable with low cost readily available components. View Sam’s incredible project in action – it’s well worth watching and will act as an inspiration to any top A Level student. Runners up in the U19 competition were Jack Hanson of Tollbar Academy, New Waltham, with his futuristic adjustable desk lamp; Wasif Khan of Queen Mary’s Grammar School, Walsall, with his child’s balance bike; and Owen Burgess of Malmesbury School with his teething toy. Congratulations to them all. was chosen as the winner with his novel mobile phone charger. Jason’s obvious love of NASCAR racing turned this project into a highly detailed design of the NASCAR 24. The complete inside was formed from a variety of steps within SOLIDWORKS, including cut extrudes to shape all the dials and essential components inside the car. The lengths to which Jason went with the intricate detailing were truly amazing. SOLIDWORKS has been adopted across the education spectrum and what is the ‘norm’ for commercial design is now becoming a mainstay of schools. The iterative design process is encouraged by SOLIDWORKS’ ability to stress test a part, go back and edit a part, output to a 3D printer or milling machine for rapid prototyping, and then back to 3D modelling again. Students who entered the competition used many of SOLIDWORKS’ features. Hopefully they will go on to take the CSWA SOLIDWORKS examination which is a professionally accredited engineering CAD qualification and perhaps, in the future, they may be at the forefront of major design and engineering projects for the UK and beyond. Congratulations to all the winners and to all the other entrants – there are simply too many to list here, but each will have received a certificate. If you have talented students who you think should be entered into our 2017 competitions, then details are on our website at www.techsoft.co.uk/Competitions.